Ever seen a bicycle longer than two trailer trucks put together? Ever seen a bicycle longer than two trailer trucks? 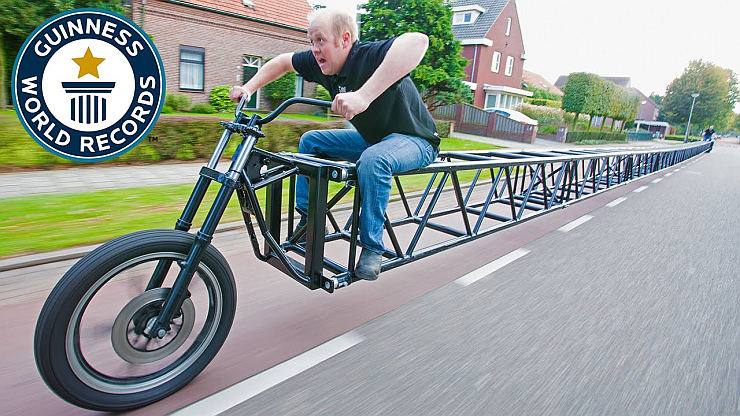 Have you ever seen a bicycle that is larger than two trailer trucks put together? Well, the Dutch, who simply can’t get enough of bicycling just built this two wheeled pedal powered contraption that is no less than 127 feet. Yes, that’s longer that two trailer trucks arranged lengthwise. This is the world’s longest bicycle and it’s just broken all records, finding a place in the Guinness Book of world records. And it needs two people to ride. One person sits at the rear and pedals while the other sits at front and steers. Here, watch how this insane bicycle gets built.